The most important reasons for visiting Verlorenvlei is to experience nature, water, birds, tranquility, peace, quietness … Here are no luxury holiday resorts or any form of organized tourism activities. The neighboring coastal town of Elandsbay offers some of the best surfing opportunities on the West Coast, but not even that attract traffic-jam crowds to this remote beach area. 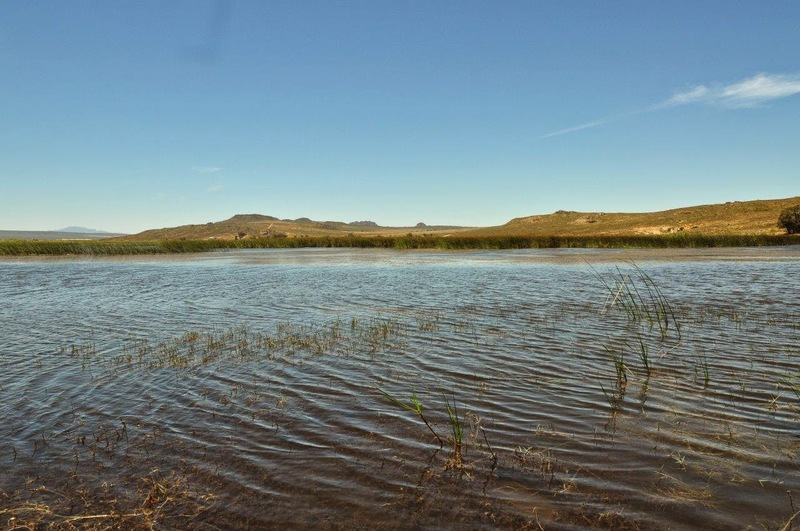 Verlorenvlei is one of the largest, natural, fresh-water wetlands along the West Coast of South Africa. It is fed by rivers from upstream, but mainly by its own groundwater. The average rainfall that occurs during winter, is less than 300mm per year. The estuary at Elandsbay is closed off for most of the time. During winter, with a bigger inflow of water from the east, the sand bank will be forced open and the water will flow into the sea. The Ramsar boundary roughly follows the water in the wetland. It is approximately 1,500 hectares and was declared a wetland of International Importance on 28 June 1991. No motorized water activities are allowed on Verlorenvlei. The shallow water and many reeds also limit the size of sailing and rowing boats that can be used on the vlei. The main attraction of Verlorenvlei is the rich bird life. Up to 190 different species have been recorded here. This includes 75 water bird species. There are more than 5,000 birds on a regular basis in the wetland area, and at times more than 20,000! Verlorenvlei is a special feeding source for the Great White Pelican. At times, approximately 200 of these endangered birds descend upon the wetland. Other rare species that can be seen here are African Fish Eagle, Greater Flamingo, Lesser Flamingo, Caspian Tern, Little Bittern, Great Crested Grebe, African Spoonbills, Glossy Ibis. A bird hide allows birders to watch these birds from close by. Surrounding the wetland is a private nature reserve, Vleikraal. The sandy surface of the area (it is known as the Sandveld), makes hiking and biking difficult. But a 4x4 route through this small reserve will allow you to see Verlorenvlei from an elevated viewpoint. Verlorenvlei is 250 kilometers north of Cape Town. The only tar road is from the south via Velddrif. There are not many accommodation options. Apart from the hotel and camping ground in Elandsbay, the camping and self-catering chalets at Vensterklip are the only nearby accommodation.